On Thursday, April 15th, 2010 class representatives from Mr. William F. Curtis’s U.S. Government classes visited and observed State Government in action at the Tennessee State Capitol in Nashville, Tennessee. Several very good things occurred on this excellent field trip. 1. The class was recognized on the House and Senate floors. 3. The class was invited to attend a meeting of the Calendar and Rules Committee in a committee room in the Legislative Plaza. This committee meeting was very contentious and an extreme display of parliamentary procedure. Representative Susan Lynn came to the audience where the students were sitting and explained to the class, “You and your class were very fortunate to see a great display of partisan at work. We probably only have about 3 or 4 partisan issues a year that become so contentious, but when we do it is exciting to see how things will turn out.” Representative Stratton Bone, a member of this committee, had the students stand and be recognized by the committee. This committee meeting was a highlight of the trip for most of the class members. 4. The class had lunch in the Legislative Plaza Café where State Senator Mae Beavers spoke with the group. Senator Beavers gave each class member a new 2009-2010 Blue Book regarding Tennessee State Government. Also visiting with the group at lunch were Representative Stratton Bone, and State Senator Jim Tracy. The U.S. Government Class of Cannon County High School would like to thank Representative Stratton Bone and his assistant Mrs. Robbie Farmer for helping make this trip possible and with great success. Also accompanying the group was Mrs. Annie Reed – CCHS English Teacher. 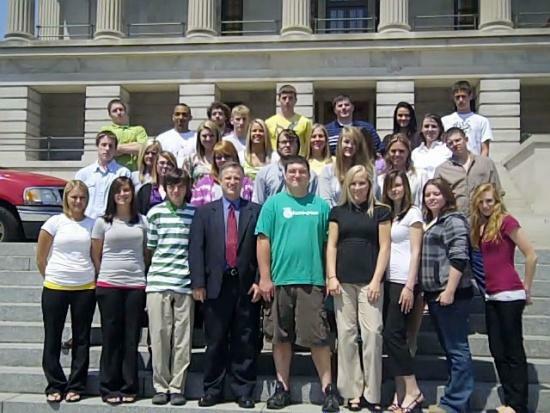 These students will remember and hopefully utilize in the future this memorable experience in Tennessee State Government. Cody Ruehlen; T. J. Mitchell; Josh Johnson; Heath Simons; Drew Gannon; Alyssa Roberson; Cameron Newman. Way to go guys! Our future leaders of america. You make us all proud here in Cannon County.